Ants play a very important role in the earthʼs natural ecosystems. They remove dead plants and animals and recycle their materials back into the soil. They loosen the soil and bring organic material underground, enriching the soil and promoting the growth of plants. 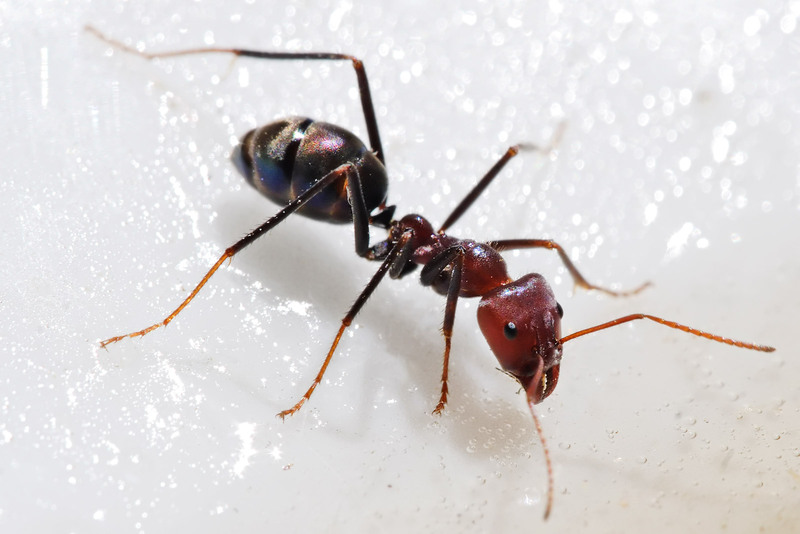 If you see an ant trail in your home or office do not panic. Most ants wonʼt hurt you, and they are easy to discourage from indoor places by removing whatever attracts them. Poisons are unnecessary and are toxic to humans and pets as well as ants. Donʼt worry about ants that are outside. If ants are climbing up your tree trunks to access honeydew produced by aphids, either do nothing or spray wash the tree with water to remove the aphids. Do not use sticky commercial products on the trunk to kill the ants when they touch it. Sticky substances will also trap and injure birds and other wildlife. If you have ants in your home, remove the sources of attraction. The ants will then leave on their own. Keep your kitchen and house clean. Do not leave crumbs, garbage, or food accessible. Thoroughly clean up grease and spills. Keep sweet foods in containers that have been washed to remove residues on outer surfaces. Rinse out empty soft drink containers and remove them from the building. Feed pets indoors; then seal and put away leftover pet food. Follow the trail, and find where they are entering. Remove the attractant that lured them inside. Without killing any ants, wipe the spot where the attractant used to be completely clean. Be patient. Wait a few hours or overnight, and the ants will exit where they entered if you don’t have other spilled or accessible food around for them. If they are not all gone overnight, with a very soft brush you can gently sweep any remaining ants into a dustpan and deposit them outdoors without injuring them. After they have left, wipe the path they took with soapy water or equal parts plain vinegar and water. Don't use seasoned vinegar. The sugar it contains can attract ants. Discourage re-entry after they have gone. Place a piece of waxed paper with the following deterrents: drops of peppermint oil, chopped fresh mint, sliced garlic cloves, fresh cloves, or shredded lemon peel at the place where the ants entered. Use any one of these repellents or a combination of them. Caulk the openings that they came through to enter your house. If you discover ants in a potted houseplant, take the plant outside, and place it in a bucket. Fill the bucket with water that reaches about one inch below the rim of the pot. Form a dry bridge for the ants by laying a stick from the pot to the rim of the bucket so the ants can escape and carry their young to safety. When you no longer see ants leaving the pot over the dry bridge, remove the plant from the bucket and let the water in it drain. Then return the potted plant indoors. After the ants leave, wash countertops, floor, and cabinet floors with equal parts plain vinegar and water. When the ants are gone, and your kitchen and other areas are clean, you can also apply Orange Guard, a nontoxic organic ant repellent around the perimeter of your rooms. Do NOT spray it directly on ants. Usually, Orange Guard is not needed once you have taken the other ant-deterring steps mentioned above.